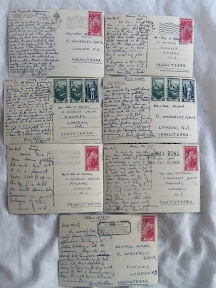 Occasionally, I find postcards written by the same people to the same address scattered among lots of other postcards. 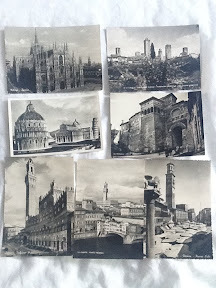 Today I found a bunch written by two gentlemen, Gerald and Alan, to M and P during their trip around Italy in July/August 1951. In his flat overlooking the Thames on Richmond Hill Alan Mann created a treasure trove. It was an eclectic collection, each object the result of an emotional encounter. Born in Finchley, London, in July 1924, he joined his father's firm of quantity surveyors after he left school, and later lived with his brother, Gerald in a flat above the business on Bloomsbury Square. Alan paid frequent visits to the British Museum on his doorstep, where his love of exotic art developed. The art of Africa seems to have ignited a particular passion, with a focus on that of the Fang of Gabon. Five works passed through his collection of which he considered the Bela Hein figure the oldest, which is why it is the only one in his collection today, bequeathed to the British Museum. It is rare that things tie up so nicely.